Most people will tell you they do not need to be told how to parent their children. While that may be the case, it is not unusual to find that these same parents have been wired to respond, more so, to the negative or destructive behaviors of their children than to the positives. What is unfortunate about zeroing in only on the negative, is that we lose out on the opportunity to provide a serious empowering process that our children can take with then as they step out into the world to become their own persons. By only responding to the negative, we also teach them not to acknowledge others who are doing their best to be productive citizens. These parents assume the posture that “this is what is expected of them, I don’t have to fuss over them for that”. Luckily for us, we are now living in a society in which an inordinate amount of good and tailored options are offered to those who care to explore ways that do not keep them stuck at the “children are supposed to ‘do as I say’, and the ‘do because I said so’ culture”. It is with all that I have said in mind, that I ask you to accommodate me while I publicly declare the elation and pride that I feel as the mother of Samuel Branch, of whom the article speaks. I am not only proud of my son for his passionate resolve to be the best that he can be in the field of graphic design, I am also proud of his friends who were at his senior show. Kudos to the students whose enthusiasm and sensitivity made the art installation process very much a part of the show. It was such a heart-warming experience to witness this! I must also congratulate Katie Webb, for an article so well-written. It is obvious that she herself is making full use of her education at Hofstra. It is clear that the parents have played a major role in making these young adults so worthy of the praise and admiration I so freely give. Congratulations to the parents! I suspect there are many takes on Mommy and Daddy blessings out there. Please feel free to share yours. Last, but not least, I must acknowledge my husband, Samuel’s Dad, without whose ‘One James’ peach cobbler, the show would not have been complete. Please click on link to article and Senior Show below. 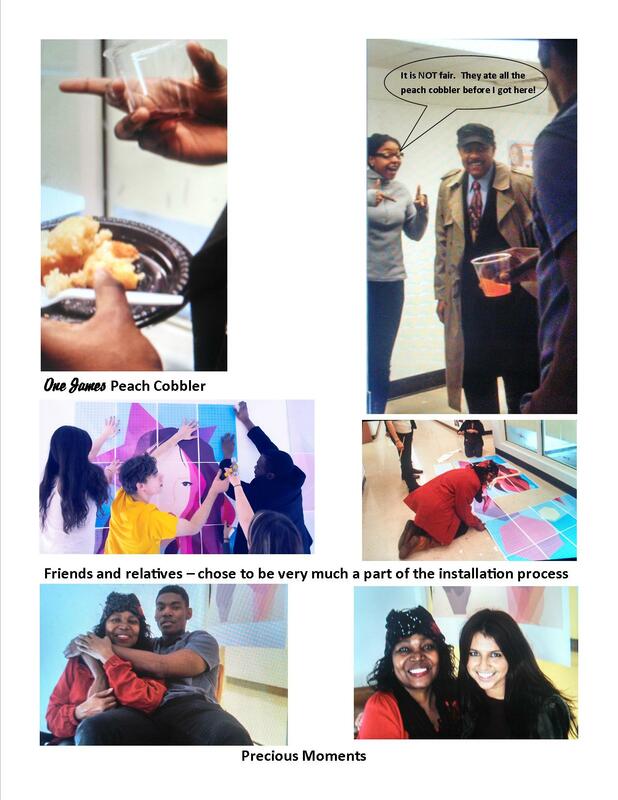 Posted by hofstra chronicle on Saturday, December 14, 2013. Vibrant, color-blocked, mosaic images composed of 35 sheets that are 11 inches by 17 inches hang on the walls of the FORM gallery this week, Dec. 9–13. The show , “Vector Variegations,” is the senior art show of fine arts major Samuel Branch.